It’s 1980, and I’m walking downhill on a cobbled street above the town center in Bath, England. It’s damp and chilly, so I am almost certainly wearing my slate-blue belted trenchcoat and L. L. Bean boots. I’ve come to Bath by myself from Oxford, where I am spending the school year studying in the Oxford Overseas Study Course, a program run by playwright Francis Warner. We go to his apartment at the beginning and end of each semester for wine-and-cheese parties in his elegant flat near Walton Street, where the wallpaper has actual leaves pressed into it. I don’t know whether I was thinking of Jane Austen or simply pondering the clouds (wandering lonely as one, surely) when a knot of rough-looking teenage boys began to call to me, trying to get my attention, daring to get closer as I walked on. I hadn’t yet seen the movie of A Clockwork Orange (I’ve still never seen it all the way through, having freaked out and left the theatre during the tennis ball scene) but they felt scary that way. I was, then as now, bookish, so seeing a bookstore I took refuge there. I browsed, and waited, and then nearly forgot that I was hiding, as I looked through crowded shelves of old books. 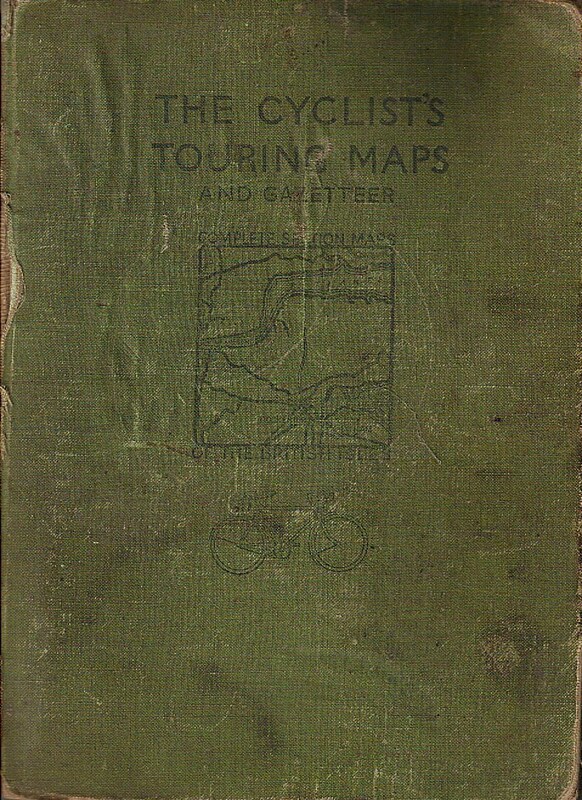 I picked up one with a weathered green cover, a book that had clearly spent some time out in the elements, The Cyclist’s Touring Maps and Gazetteer. I had gone on a three-day bike trip as part of my freshman orientation at Hendrix College, and I still had my green ten-speed at home. For the year at Oxford I had purchased a brown, three-speed Raleigh that got me everywhere I needed to go in style and relative comfort, provided I remembered to stay to the left. As I browsed through the book, heavily annotated, I found all kinds of extras: not only marginalia but lists, clippings, drawings, directions. 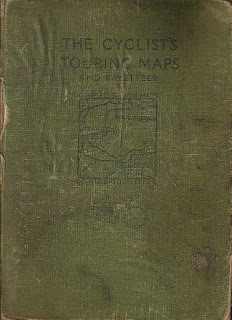 It felt like magic, like a map not just of cycling routes but of a life, mysterious, rich, adult. On the back inside cover were drawings for a “Seaside Bungalow,” and on a thick piece of paper in the back were more drawings, carefully planned out and colored in. Most intriguing were typed directions, on the back of a Masonic Lodge program from 1966, of directions from Bristol to Merriot [sic] Village, ending “Ask for the road to Boozer Pit. ‘Flaxlands’ is the name of Jim’s House.” Who was Jim? Why Boozer Pit? Some day, I thought, I would follow the directions and see what I found when I got there. The final loose item in the book was a section of pages from a school notebook, about 6” by 8”. Handwritten in blue fountain-pen ink, with a fine cursive hand, it was a history of China from Prehistory to 1800, with a column for the date, a column labeled “Dynasty and Ruler,” two columns under a larger heading of “China” titled “Memorable Men and Events” and “Principal Artists, Monuments, and Art Developments,” and under the larger heading of “Concurrent World Events,” two more columns headed “Principal Artists, Monuments, and Art Developments” and “Memorable Men and Events,” eight pages in all, written on both sides. I bought the book, of course, and when I left the bookstore the boys were long gone. I imagine I studied the book in my B & B that night, and I have kept it for thirty years, always thinking I would learn its story some day. A few weeks ago I determined to clean out my shelves to make more room for poetry books, and I found the book in a safe corner where I had tucked it away. I looked at all the contents again, including a letter from my philosophy professor at Hendrix, John Churchill, who had been a Rhodes Scholar. It was a nice leisurely typed letter, apparently in response to one I’d written, with suggestions for pubs (among them the Trout and the King’s Head) and Evensong at Christ Church Cathedral, news from Hendrix, and political commentary—Reagan had just been inaugurated. It’s a time capsule of a sort, as well. I don’t think I’d looked at the book since the birth of the internet, and it occurred to me that now, finally, I might have the research tools to find out more, literally at my fingertips. I went to the Cinema Theatre Association webpage, sent an email, and a few days later heard from the Archivist, Clive Polden, that the gazetteer had been compiled by the late Mervyn Gould and that the Newlyn Cinema continues to function as a restaurant “and looks lovely, accessed via a footbridge over a stream.” He sent me a picture of the archives with volunteers and researchers at work, and one of the archives room, which I have posted, with his permission. I’ve decided that it’s time for the book to end its long exile from England and today I put it in the mail to the Cinema Theatre Association so that others will be able to pore over it as well. I’ve scanned a few of the pages for memory’s sake and will of course save the letter from my philosophy professor, which is a part of my archive, not A. J. Carle’s, though I enjoy the idea of layered histories in one book. This whole story reminds me of a wonderful film I saw once on PBS. 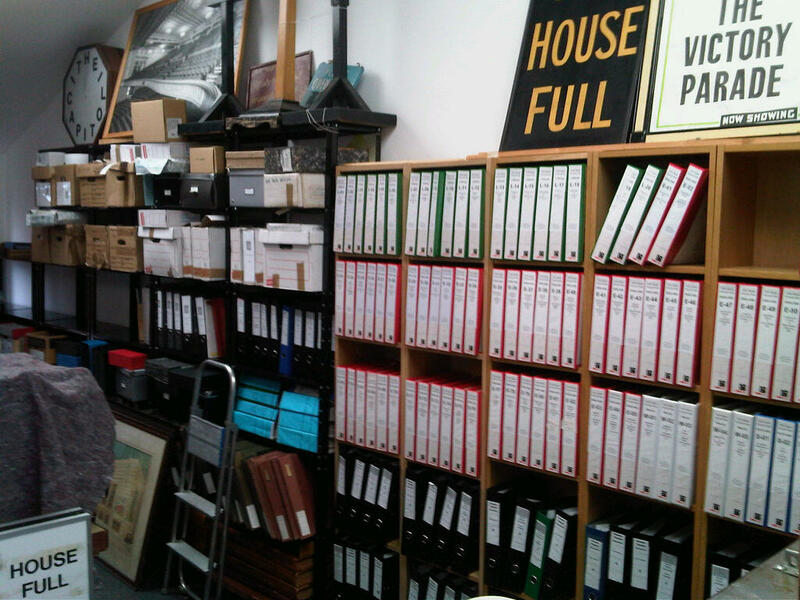 A photographic archive of the twentieth century, housed at a country estate outside of London, is threatened with being purchased by a large photo archive business that plans to split up the collection. The staff, an oddball collection of experts in photography and history, attempts to make the case for keeping the collection intact by assembling the story of just one woman who can, almost miraculously, be traced from a childhood in Nazi Germany to life as an elderly street person in London, all via the photographs. So many stories in the photographs, they say, all lost if the collection is dissolved. You can guess what happens. It’s probably my favorite movie ever, and don’t know the title and have never been able to find it again, search IMDB and the BBC website as I may. If anyone knows of it, please do let me know. Jennifer, what a great tale, and much more layered than I realized! And now this posting also contributes to the biography of the object.